As I am lagging on getting my "how-to" up on the web- here is a great one I found by Jenny Ryan at the Craftzine.com blog. 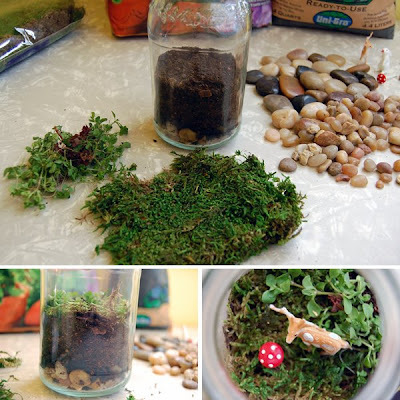 She covers most of the steps I would recommend and it's a great "how-to" for making a terrarium in a wide-mouth, uncomplicated container. Looks so easy... Shoul I try? Love it, like a garden for a doll's house. Thank you again!! We are studying plants/seeds in science and my first graders are going to make terrariums. I am linking to this page to give parents an idea of the supplies they will need.